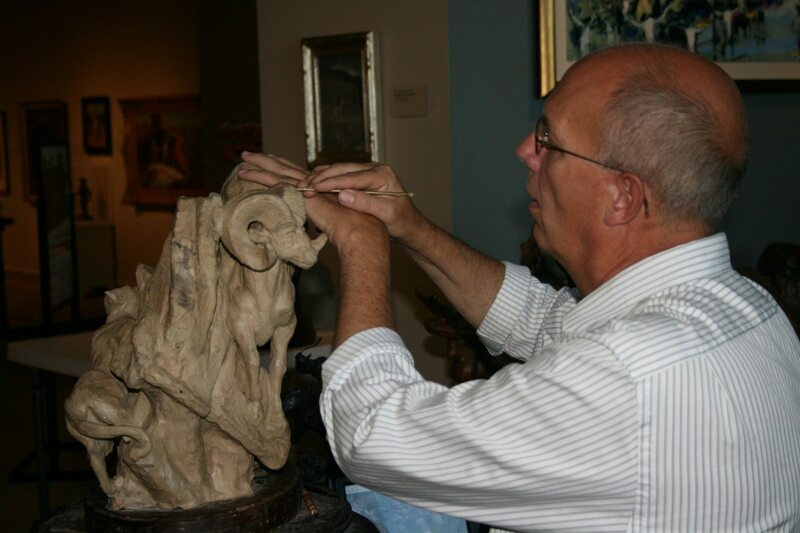 Jeff Rudolph, shown here sculpting with clay, serves as Artist-in-Residence at the Buffalo Bill Center of the West July 16–20. For the week of July 16–20, 2018, visitors to the Buffalo Bill Center of the West’s Whitney Western Art Museum have the opportunity to interact with award-winning artist Jeff Rudolph, who serves as Artist-in-Residence for the week. Stationed in the gallery each day from 9:30 a.m.–3:30 p.m., Rudolph demonstrates his work and technique while chatting with visitors. A noted sculptor with work in galleries throughout the western United States, Rudolph also has a prominent place in the public art scene in Cody. The grizzly bears and bison found throughout the town are of his design, and his Buffalo Bill sculpture Spirit of Cody greets visitors to Cody’s City Park. Born in Cody, Wyoming, where he currently lives and works, Rudolph credits his father’s carpenter shop for first sparking his interest in art. He earned his BA at Brigham Young University. He has served as Artist-in-Residence in the Center’s Whitney Western Art Museum—and as an instructor for various art workshops at the Center—numerous times. Rudolph is a frequent entrant in art competitions and has won several regional and national awards. His work is always a crowd favorite at the annual Buffalo Bill Art Show & Sale held each September in Cody as part of the weeklong arts celebration, Rendezvous Royale. “Although sculpting in stone is my first love, I enjoy working in terra cotta, bronze, and wood as well,” notes Rudolph on his website. “All of these materials are terribly attractive and lead me in different but completely compatible directions.” In his work, he seeks to evoke an emotion, spirit, or feeling to which viewers can relate. The Center of the West’s artists-in-residence program is supported in part by an award from the Wyoming Arts Council through funding from the National Endowment for the Arts. For information on Rudolph’s residency or the program in general, contact Emily Buckles, Interpretive Specialist for Programs and Natural Science Educator, at [email protected] or call her at 307-578-4110. For the Center’s full calendar of events, visit centerofthewest.org/calendar.